Montana’s autumn is my favorite time of the year to do field work. Daytime temperatures are usually cool enough to encourage one to keep moving and the lighting is simply gorgeous. It is also one of the best times to visit areas in and around Yellowstone National Park (YNP) because most of the tourists have gone home. So no huge bear traffic jams or jostling for parking spots at the better known thermal spots in YNP and surrounding environs – it’s just a wonderfully introspective time for field forays. What follows are several photos that chronicle some of my fall wanderings in the greater Yellowstone area, both in terms of wildlife and geology. Some of my favorite sightings in YNP are bison at any time of the year. But the autumn snows bring on the bison’s technique of using its head to clear snow away from any vegetative food source. The result of their snow-clearing activity is a snow-masked face. Snow-caked face of a bison in YNP portends the winter food retrieval. Snow-masked bison near Soda Butte Creek, YNP. And where the snow hasn’t stacked up much, the YNP bison calmly graze and occasionally congregate on a ridge line to watch what remains of the YNP visitor traffic. YNP bison contemplating passing vehicles. Geological features in YNP take on new dimensions with the golden low and slanting light of autumn. I’ve spent much time re-photographing geologic features at all scales that seem to glow in this season’s light. Tertiary sediments and Quaternary sediments/basalts of “The Narrows” cliff face adjacent to the Yellowstone River, northern YNP. Columnar basalt capped by auto-brecciated basalt makes a morel-like image for these geological units. An early morning at -7 F on the Lamar River with steam fog resulting from the fall’s chilled air moving over water still warmed from summer. A rodent trackway disappears into microterracettes of Palette Springs, Mammoth Hot Springs, YNP. Microbial growth near the proximal part of Mound Springs, Mammoth Hot Springs, YNP. The proximal end of Mound Springs abounds in various colored microbial life. It’s hard to stop photographing these features because they are so intriguing! The lipped margin of Mound Spring’s pond facies, Mammoth Hot Springs, YNP. The fall staging areas of sandhill cranes in southwestern Montana are mesmerizing. Staging areas are those locations where cranes annually congregate during late September into October, spend several days foraging through fields for food, and eventually continue on their migration southward from Montana to Colorado and the southwestern U.S.. The staging area that I usually go to is near Dillon, Montana, where hundreds of cranes can be viewed. Sandhill crane interaction during their fall staging near Dillon, Montana. Sandhill cranes doing a dance routine in the Dillon, Montana staging area. As I said initially, it’s hard to surpass a Montana/YNP autumn! The Gravelly Range spring deposits depicted in this photo are late Eocene (probably 34-36 million years in age). Geologic field work is always fun, but especially so when it turns up something unexpected. Working on Eocene to Recent geology and vertebrate paleontology in the Gravelly Range, southwestern Montana promised to be enthralling because the volcanics, sedimentary units, and vertebrate fossils are at elevations of about 9,000 feet. But to come across extensive, unmapped calcareous spring deposits of probable Eocene age is topping off research efforts. At this point, I’ll just say that our field team is still at work on the Tertiary spring deposits. We’ve found numerous leaf impressions including those of ginkgo, palm, metasequoia, Fagopsis (extinct member of Beech family), and alder – just to name a few. We’ve shown the plant assemblage collected to date to several paleobotanists, and, at least for age, their take is that the assemblage is probably latest Eocene in age, and bears many similarities to Florissant, Colorado fossil plant assemblages. Palm frond impression from Gravelly Range spring deposit. Ginkgo leaf impression from a Gravelly Range spring deposit. Alnus cone from a Gravelly Range Spring deposit. The spring deposits in the Gravelly Range are extensive, covering an area roughly 2 miles in length with deposits up to 120 feet in thickness. The springs are best characterized as travertine, although the spring systems’ edges contain clastic fluvial units and both the springs’ edges and pools have features such as plant impressions, root systems, and small travertine balls. Gravelly Range Eocene spring deposit. Field backpacks in lower left corner for scale. Because the Gravelly Range is so close to Yellowstone National Park, it is extremely interesting to compare its Eocene spring deposits to hydrothermal units at both the currently active Mammoth Hot Springs (which probably began its activity about 7,700 years ago), and to the fossil travertine found just north of Gardiner, Montana, that formed about 19.500 to 38,700 years ago (Fouke and Murphy, 2016: The Art of Yellowstone Science: Mammoth Hot Springs as a Window on the Universe). The Gardiner travertine is fairly well exposed because it has been extensively quarried for several decades. Of interest for comparison are numerous plant impressions that occur within microterracettes. Fouke and Murphy (2016) suggest that these may be impressions of sage brush. A photo of the quarried wall with the plant impressions is shown below. Plant impressions in Gardiner travertine. These impressions may be from sage brush. The travertine in this quarry face is estimated at about 30,000 years in age. Other features in the Gardiner travertine, now partly covered by graffiti, include a quarry wall that shows terracettes and microterracettes that are outlined by darker lines within the travertine. These features are probably indicative of a proximal slope facies. Gardiner travertine with its slope facies depicted well in smooth quarry face. The dark, irregular lines delineate terracettes and microterracettes. Jumping forward in time to the extensive spring deposits of Mammoth Hot Springs (just within the northeast park boundary of Yellowstone National Park), is mind boggling. As in any comparison with rocks as old as Eocene to active deposition, one realizes how much detail is lost over time. But it is still worthwhile to try to compare spring features, so I’ll show a few photos of the Mammoth Hot Springs that may match up with various features of the fossil springs. Branch and plant fragments in the process of becoming calcified at Mammoth Hot Springs – main terrace. Calcified plant debris – Mammoth main terrace. Terracettes – Mammoth main terrace, proximal slope facies. Trees engulfed by prograding spring activity – Mammoth main terrace. Travertine balls in small pond – Mammoth main terrace. Suffice it to say, that the upcoming field season should be a good one, with more work to be done on the Gravelly Range spring deposits. And – it’s always fun to get a trip in to Yellowstone! Cross country skiing in one of the glacial melt-water channels on the Blacktail Plateau. Some winter days in Yellowstone National Park are so amazing with clear blue skies and sparkling snow that they just take your breathe away. Luckily enough, I just experienced several of these kinds of days which I packed full of cross country skiing, snowshoeing, and animal watching. One of the groomed trails that held a good snow base until about early afternoon is the Blacktail Plateau Loop. 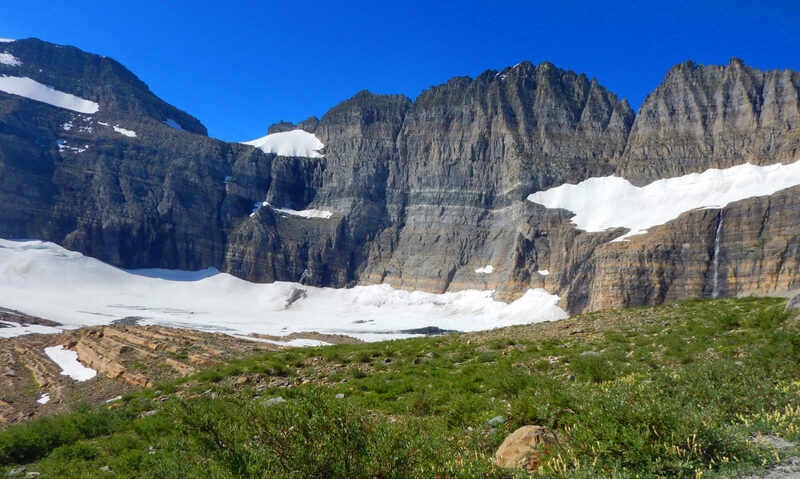 The trail follows melt-water channels that are associated with “Retreat Lake”, which was formed by the Beartooth glacial ice mass blocking the lower end of the Grand Canyon of the Yellowstone during the Pleistocene. Rounded cobbles and boulders left behind from melt-water flow sit on the volcanic bedrock in many areas along the trail. Ski tip in the lower right for scale. Looking back to the northwest on the Blacktail Plateau ski trail. Notice the scoop-shape of the landscape which is the result of this area being part of a glacial melt-water channel. Calcite Springs overlook is accessible during the winter via the Tower ski trail. The Tower ski trail provides access to the Grand Canyon of the Yellowstone area. A favorite stop of mine is the Calcite Springs overlook where the thermal springs lie south of the overlook, on the west side of the Yellowstone River and Pliocene/Pleistocene sediment and basalt are on the Yellowstone River’s east side. A groomed ski trail also accesses the Upper Terraces of Mammoth Hot Springs. However, after a few days of spring-like temperatures, the snow was so melted back that I just used my snowshoes to trek through the icy slush. Some thermal features were still covered by snow and slush, but others appeared much more vibrant against the white snow/slush blanket. One of the fissure ridges along the upper Terraces trail is called White Elephant Back Springs and Terrace. My favorite thermal feature of the Upper Terraces is Orange Spring Mound. The spring is supported by a fissure ridge and is intermittently active. Because of its low water discharge and subsequent slow growth, it has built up a characteristic cone shape. Orange Spring Mound of the Upper Terraces in Mammoth Hot Springs. All in all, it was perfect wintertime fun trekking around in Yellowstone. Can’t wait to get back there when the bears come back out from hibernation! Volcanic stratigraphy is hard to ignore when touring through the Teton to Yellowstone National Parks (YNP) area. Three major volcanic eruption cycles occurred during the last 2.1 million years and resulted in hundreds of feet of volcanic rock. The eruption cycles make a good basis for separating the volcanic rock units and consequently there are three major volcanic stratigraphic units. These major units consist of ash-flow tuffs that erupted at the peak of each cycle and include the Huckleberry Ridge Tuff with an age of 2.1 million years, the Mesa Falls Tuff with an age of 1.3 million years, and the Lava Creek Tuff with an age of 0.64 million years. The type section of the Huckleberry Ridge Tuff is at the head of a landslide scarp on the Flagg Ranch, about 1 mile northeast of a bridge across the Snake River. The type sections of the Huckleberry Ridge Tuff and the Mesa Falls Tuff are fairly accessible. The Huckleberry Ridge Tuff type section sits at the head of a large landslide about 1.5 miles south of the YNP’s south gate and 1 mile northeast of the Snake River Bridge. It’s a big landslide, so it’s easy to spot from the highway. The type section mainly contains welded rhyolitic ash-flow tuff. This huge eruptive event (one of the five largest individual volcanic eruptions worldwide) associated with the Huckleberry Ridge Tuff formed a caldera more than 60 miles across. The type section of the Mesa Falls Tuff is a road cut along Highway 20, about 3 miles north of Ashton, Idaho. The Mesa Falls Tuff type section is really accessible as it is alongside Highway 20, about 3 miles north of Ashton, Idaho. The type section consists of airfall tuff, partially welded tuff that has an agglomeratic base. The eruption associated with the Mesa Falls Tuff formed the Henrys Fork Caldera which is in the Island Park area west of YNP. A more detailed view of the Mesa Falls Tuff with its airfall ash overlain by partially welded rhyolitic tuff that has an agglomeratic base. Roaring Mountain lies within the Lava Creek Tuff outcropping area in YNP (photo from NPS/Peaco – https://www.nps.gov/yell/planyourvisit/norrisplan.htm). The Lava Creek Tuff type section is much more difficult to access as its type section in the upper canyon of Lava Creek, about 8 miles into the backcountry of YNP. There are a couple reference sections that are easier to reach, and one is in Sheepeater’s Canyon, about 0.5 miles northeast of Osprey Falls. The Lava Creek Tuff is also readily seen in the south-facing cliffs along much of the Gibbon River. The eruption associated with the Lava Creek Tuff created the Yellowstone Caldera, the 35-mile-wide, 50-mile-long volcanic depression that dominates the present YNP landscape. There are many more volcanic units associated with the three major eruptive cycles. But spending time looking at the major ash-flow tuff units is a good way to begin to delve into Yellowstone geology. As Wildlands Fires Ravage Western U.S. – Is This The New Normal? Debbie Hanneman is a geologist who lives in southwestern Montana and owns Whitehall Geogroup, Inc., a geological consulting company. She writes about her interests in geology, energy, and climate change for Geopostings. Connect To Science Blog Directory!